The Jefferson Memorial, commissioned by Franklin D. Roosevelt, is a tribute to the third president of the United States, founder of the University of Virginia, and key drafter of the Declaration of Independence. Its Pantheon-esque facade and bronze statue of Thomas Jefferson overlook the Tidal Basin and Washington Monument. 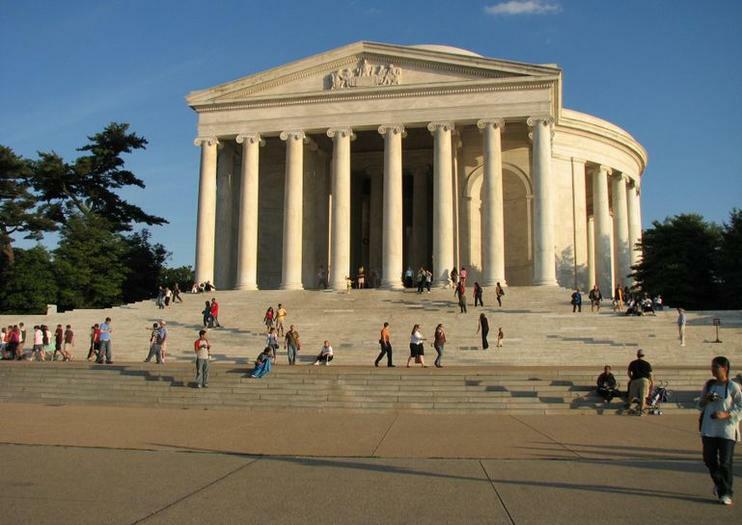 As one of Washington DC’s top landmarks, the Jefferson Memorial is included on most DC monument tours that circuit through the National Mall. Walking and Segway tours typically include access to the inner chamber as well as time to explore, while Potomac River cruises and bus and van tours offer long-range views of the memorial and surrounding cherry trees. Restrooms are located beneath the memorial in the visitor center, accessible by elevator. The inner chamber is wheelchair accessible through the visitor center. The National Park Service has rangers on duty from 9:30am to 11pm daily. Public transport is the easiest way to reach the memorial. Take a 15-minute walk from the Smithsonian Metro station stop to the Tidal Basin, hop on the National Mall Circulator bus, or grab a Capital Bikeshare bike from multiple locations around the National Mall. Book a tour with round-trip transport to avoid the hassle of navigating. The Jefferson Memorial is open 24 hours a day, year-round. Though the hours between 6pm and 9pm are the busiest, going in the evening is worth the crowds for sunset views. Visit in the morning to beat the crowds, or take an evening bus tour for views of the memorial illuminated at night. The memorial and surrounding Tidal Basin are popular among visitors during peak cherry blossom season, from late March to early April. Sit on the steps of the Jefferson Memorial. Now, spot the White House. When President Franklin Roosevelt got to Washington, he lobbied for a memorial of the predecessor he idolized. When the plans were finally approved, Roosevelt chose the site on the Tidal Basin because he wanted a direct view of his creation from the White House—so much so that he ordered trees to be cut for a better view.